DIANE ROSEN is a New York-based artist, writer and educator. She studied at l'École des Beaux-Arts in Paris on a one-year French Government Painting Fellowship, and in New York at the Art Students League and Columbia University, where she received a Master's degree. 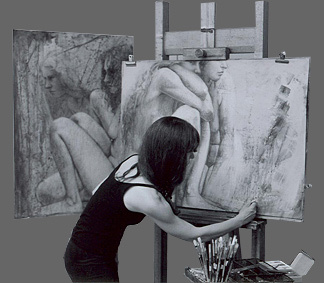 Her work has been featured in American Artist, The Pastel Journal, and Pure Color: The Best of Pastel, among others. A Pastel Society of America (PSA) Master Pastelist, she has taught studio art from secondary to college levels, including at Parsons School of Design, NY. Rosen's interdisciplinary articles on creativity appear in journals including American Journal of Play; NY Metro Parents; Perspectives on Creativity Volume II; and Nonlinear Dynamics, Psychology & Life Sciences. Numerous awards include: Art Spirit Foundation Gold Medal (PSA); First Place Mixed Media (Catharine Lorillard Art Club); Sindlinger Award for Excellent Writing on Education (Columbia University); listing in Who's Who in America and Who's Who in American Art. Her paintings and commissioned portraits are in private collections in the US and abroad.